HANK PHILLIPPI RYAN: My mother died a few years ago—you know that, right? And I still think of her, of course. The times when I roll my eyes at something, and know she’d be doing the same thing. Or when I have a big realization, and want to give her the opportunity to say I told you so. Or when I need to make a decision about a crisis. Or a dress. Though I became “Hank” in 1967—thanks to some unremembered classmate in college—she ever called me that. Not through all my years as a reporter with my name “Hank” on the screen. She called me Ann, unwaveringly. Or Harriet Ann, if I was in trouble. It wasn’t until my first book came out, with the name on the cover, that she embraced “Hank,” It was--and this is just between you all and me—as if I had finally done something that was good enough. She was quite the character. Brilliant, and stylish, and funny, and artistic. Generous. And, um, opinionated. Mom would inform us "Every day is kids' day. You just don't realize we're celebrating." Anyway, Mom loved that I was writing, although once it led--almost--to a battle royal. I had sent her the galley of Face Time. I was all excited, I knew she'd love it. Rage? I thought--rage? How could that be? So I said, all conciliatory, "Mom, Mom, I don't understand. Rage? Why?" And she said (please still imagine the tone of voice) "Charlotte McNally's mother is going to Boston for a face lift. Now everyone will think I did that!" I tried not to laugh. I explained to her, as gently as I could, that it was fiction. That Charlotte McNally was fiction, and Charlotte McNally's mother was fiction. "You're not Charlie's mother," I tried to assure her. There was a pause. And then she said, "Of course I am, dear." Anyway, finally we made a deal. She promised to read the whole book, and then let me know how she felt. She did, and called me a day or so later. Crying. Mom said, "Oh, honey. I loved it! And this is the first time I've ever cried at the end of a murder mystery. It's actually a mother-daughter love story!" And indeed, it is. And that's exactly how I meant it. As Mother's Day draws near, I wish Mom could see this gorgeous brand new edition out today from Forge. Like all Charlie books, you don’t have to read them in order, and if you’re a fan of Serial and Making a Murderer, Face Time is just the book for you. And your mom. And Reds, and readers—did your family or friends or classmates have a nickname for you? I was Pook for a while (thanks, Dad! ), then Ann, or Annie. How about you? What a sweet story . . . it's wonderful to have such special memories. No nicknames, but I was often called "Jean" [my twin sister's name] because folks couldn't could tell us apart . . .
Hank, your mother sounds lovely. I sometimes wish my mother had stuck around... to meet her grandchildren and enjoy all the books her four daughters published. She died when I was 22, long before I started writing. Nicknames? "Hallie" was bad enough. I hated it then and everyone always asks me: IS it nickname. It's not. I was Edie growing up, of course, and it took me a long time to shed that nickname as an adult. Everyone in California (that is, my relatives and school friends) are the only ones still allowed to call me that. The first boyfriend I lived with called me Max. We lived in Japan together while he was in the Navy and all the Navy guys really wanted it to be short for Maxine. Nope, I told, them: Maxwell. Loved the ensuing look of bewilderment. Then when I went on match.com after my divorce, I used Max as my screen name. Hugh has called me Max ever since, which means everyone in his family does, too, and friends I first met through him. That's a nickname I can live with. Oh Hank--reading this lovely post made me tear up. It's been five years since I lost my mom, and I still occasionally reach for the phone to call her. So silly. I love that your mom got to read Face Time (it's my favorite Charlie book!) and her initial reaction made me laugh. I so wish my mom had been here to see my first book published--it wouldn't be, if she hadn't been so very insistent that I had given up too easily and should try again. Nicknames: my mom and her sisters always called me Shelley (from my middle name). They're the only ones who ever did, and I still miss it sometimes. I love the name Hallie, Hallie! And Joan, I always wished I had a twin. I have a sister close in age so we call ourselves Irish twins. My Mom was overtaken by Alzheimer's before I even got close to publication. I acknowledge her in my books for all she did along the way. She helped me sound out words, supported my four-year-old yearning for a library card, and throughout my girlhood, put up with my constant reading. I can still hear her: "Bren." (slightly louder) "Brennie." (louder still) "Brenda!" (finally) "Brenda Mary! It's time to set the table!" My dad called me Brown Eyes, because I was the only daughter who had them. Hallie, I wondered at first if it was a nickname, too. Now of course Hallie is cool, and so chic. Like Halle Berry, and the other actor, what's-her-last-name Hallie. If Harriet the Spy had come at the right time, I'd probable be Harriet today. Well Edith, after Downton, I don;t wonder that Edith is coming back! And I love Max! And Harriet, yeah, I like it now. But alas, too late. Nicknames: Growing up, I was Mona, which I despised then and still do, so don't even think about it. In college, I was Cricket for a while. My mother is still with us, and she understands fiction so I don't have to explain to her, but my dad--also still with us--is the one who has to be reassured that the people acting badly in my stories and their deeds are all made up. I will never be able to have a red-haired bad guy, because my husband has red hair, and I don't know if my dad could be unconvinced about that one. I love this story Hank. And I know your mother remains proud of you (and this lovely new edition of "her" book). As for names: When e-mails were first becoming ubiquitous, I didn't know what to use as an address, it never felt right to use my real name back then. So I took my initials and turned them around - resulting in ZAK and then added some other stuff to it. Long story short, there are still a few folks who insist on calling me ZAK, to the wonderment and confusion of others. LOL. I love that story, Hank! Annette, it made me cry, too. Harriet the Spy made that name cool. All the young women now having babies loved that movie when they were kids, I bet, and the book, too. My girls sure did. What I've always liked about my name is that it's hard to shorten. My dad called me Sugar and Toots when I was little, and one of my aunts called me Karen Lucy (my real middle name is Louise). My best friend from high school still, 47 years later, calls me Brenner, which was my maiden name. Oddly, that's what my youngest brother's new wife calls him, too, and I always think she's talking to me! Knee-jerk stuff dies hard, doesn't it? My oldest daughter is Christine. Her planned nickname is Christy, but also Chris, Weezie (who knows), and her dad still calls her Crispy, or Critter (even though she is now 45 years old). The names I gave the other two are like mine, hard to shorten, but people (including their parents) do, anyway. It's so irresistible to give people nicknames! Although I don't have one that shortens of changes Jonathan, come to think of it, since I call him Wheat. Which came from Sweetheart. And oh, yes, LynDee, your mom knows! And Brenda, absolutely! That's SO classic--the escalating formality of names to indicate the escalating emotion… I love Brennie, though. Hmm..always on the lookout for character names..
Ramona, wasn't there a really cool girl in the movies or TV who was Cricket? On--77 Sunset Strip, maybe? And yes, my dad still says to me: Honey . I was never a "cub reporter." ANd I say--I know. Dad, CHARLIE'Ss father was once a cub reporter. ANd the same conversation ensues. ANd CHarlie's father is dead, too, and that was actually difficult for me to write, since I worried my father would be upset. Reality interferes..
Karen, I love Crispy. ANd Critter! SO funny. ANd yes, the wiring just embeds itself and that's how we think of people, era by era. Though Kristopher, I think ZAK is perfect for you. I'm so glad you all hunk this story is poignant (thank you, Annette!) --but wow. Mom was really angry. Really angry! But yes, it all worked out. We have a wonderful little next door neighbor whose name is Georgia. When she was tiny, we all called her Porgia. WHich she-now 7--hates. Understandable. I guess.But it is SO irresistible! (Trying again.) That’s such a sweet story. When introduced to my first grade teacher, my mother told her my name is Pamela, but we call her Penny. I was flabbergasted! And I was pretty sure I couldn't spell it. Then, in high school, some teachers thought I was twins. I legally changed my name the first chance I got. What, Penny? YOu mean..you'd never been called Penny before that? My mother died in 2001, long before I really started writing in earnest. My grandmother (whose last name was Milliron, what I use for my crime fiction pen name) also died in that year. I' like to think they'd both be proud of me. Well, Grandma would think it was a kick. Mom wasn't much of a reader and never understood my obsession with mysteries, so I think she'd be proud, but puzzled why I wanted write about such awful things). 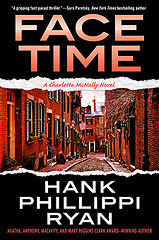 Love the new cover for FACE TIME and the story about your Mom, Hank. I will definitely be picking up a copy, even if I have to special order it. No nicknames for me. Well, no nicknames I'm going to share. My grandfather was good for them, but they are not names that go outside the family. It's hard to shorten "Mary" although a few folks in high school tried "Mare," which I shut down pretty fast (I didn't want my nickname to be the same as a female horse). At home I was always "Mary Beth" but that was only because my mother's name was also Mary (she was Mary K) and that was the only way to distinguish who you were talking to. My mother did the increasingly formal name thing when she got mad: "Mary Beth, Mary Elizabeth, MARY ELIZABETH LEDERMAN." I had an aunt and uncle who always called me "Mary Elizabeth" because that was the name on the birth announcement. I thought I was in trouble every time they said it. My mom - who was my model for loving to read mysteries - never got to read any of my books, either. She died six months before my first one came out. When she was mad she called me eDITHa. I hated it. But now she's Great Uncle Albert's new girlfriend in the assisted living residence in my Local Foods mysteries. It's Mommy all the way, beating everybody at Scrabble, wearing her embroidered sweatshirts and velcro tennies. Except even her character has evolved: the fictional Marilyn has an iPhone and texts her grandkids! Who knew. My mom never had anything digital. Lovely thread of memories today. Lovely post, Hank. Started my day with a sniffle, but it was a good sniffle. My mom died in 2013, and she'd had dementia for at least a decade before that. I thought as time went on I would miss her less, but weirdly it's been just the opposite. A half dozen times a day I think, "Mom would love this..." And especially with the new baby. Her GREAT granddaughter. She was a terrific grandmother to my daughter and she would have adored little Wren. Nicknames: (And by the way I love Harriet, and Hallie.) I grew up as Debbie, which I hated. Hated! Hated it even more as an adult. When I sold my first book I told everyone I knew that I was either Deborah or Deb(s). But my relatives still call me Debbie. So do my husband's family, because they've known me from a teenager. I don't mind that at all. But when someone I don't know presumes to call me "Debbie" they instantly go on my blacklist! My mother, who happily is still very much alive and badgering everyone she knows to buy my books, would call me JULIA JEANNE when things got serious. So now I do it to myself! "Julia Jeanne, where did you put that book down?" My mother thought I should be a writer before I did. I owe so much to her: a book-rich childhood, teaching me good writing and the rules of grammar, encouraging my talent for the written word. Thank, you, mom! Julia, I can't imagine you as Julie! Isn't that funny? Not that I don't like it, but it just doesn't seem to suit you. My mother died six years ago, Hank, and I still dream about her several times a week. Most recently I was attempting to teach her how to do push-ups four different ways. She was utterly bewildered as to why. When I woke up, I realized I was trying to show her how strong I'd become. I don't think it suits me, either! Well, as a little girl. As soon as I went away to college, I reclaimed my full christened name. Thank heavens for parents who gave us both dignified grown-up names. I knew an adult woman named "Sunny" once. She taught yoga. Yes, that was her full name. Your mother story brought tears to my eyes, Hank. My mom died a mo th after my first mystery came out so she never had a chance to see any if my achievements. And I still miss her. I have a number of aliases. I am named Patricia Ann, a popular name way back when, but not one I thought much of. At school I was Patricia until it evolved to Pat in elementary school. However I was always Patricia to Mom until she picked up calling me Pat like my friends did. However, again, I was Trish or Tricia to my siblings and my dad. My little brother couldn't say Tricia so he called me Tershes, and then Tersh. Which Dad picked up. He wrote letters to Dear Tersh while I was in college. Dad is gone, but I remained Tersh until his death. I am Pat to Mom, my husband, and my friends. Trish to family. Oh, and I was Miss Pat to my dear father-in-law. I absolutely hate when someone (usually a salesman) wants to get friendly and calls me Patty or Patsy. If my eyes could shoot out death rays he would be a pile of cinders. And yes, when Mom was calling it would escalate to PATRICIA ANN! Hank, I love the pictures of your mom and you and your mom! She was gorgeous and so elegant looking, and, of course, her daughter followed in her footsteps. To have your mother cry at the end of the book must have been the best praise ever. So wonderful that you and your mother got to share this special story together. Oh, and calling Jonathan "Wheat" is adorable. I was born Kathleen Louise Boone, and I've been called Kathy pretty much by everyone since. However, my family would use Kathy Lou at times, especially my sisters, and while I didn't particularly like the Lou, I am washed with a sweet nostalgia when I hear Kathy Lou now. My almost-daughter-in-law will call me Kathy Lou sometimes, just because she knows I like to hear it. The only person who ever called me Kathleen was the woman who served as a surrogate grandmother to me. All my grandparents were already dead when I arrived (my mother was 43 and my father was 52 when I was born), but this dear lady stood in wonderfully. There is one other name, which I wasn't too crazy about. Boonie was a name one of my friends used some, and it irritated me, which I later realized was the intent. I am extremely proud of the name Boone and my famous ancestors associated with it, but I think I would have preferred Boone instead of Boonie. Enjoying all the stories--and the photos of your mom--she looks like a movie star, Hank! People who don't know me sometimes try to ingratiate themselves by calling me "Flo." As anyone who knows me even slightly will attest, the use of that name could get someone kneecapped--just saying. My baby sister was christened Barbara Louise, but was so tiny when brought home from the hospital that my oldest brother exclaimed: "She's so teeny!" Teeny, Teener (of course, rhymes with Wiener), etc., became her nicknames. An aunt was so confused that she thought my sister's name was Tina Louise, and called her that until the day she (auntie) died. Oh,Hank. I love this. I LOVE this. I would have loved your mom, and yes - Face Time was ABSOLUTELY a Mother/Daughter love story and I loved it. (How many times can I use the word love in this comment, I wonder?) Do you remember, oh way back when, that I wrote you a note about how much I loved it and you wrote back and said "you. get. it. You get it!" Sending hugs, sweetie - and lots of love. Nicknames - oh, I've had a few. My name is actually Kaye Alan. That what all my family know me as, that's what all my Cambridge friends know me as. I'm not sure how I lost the "Alan" along the way, but I'd like to somehow get it back. "Kaye" is just boring! Love this, Hank! I can totally imagine the tone - my mother had a similar tone. And I was never, never Liz - always Elizabeth. Now when someone calls me that I cringe, thinking I'm in trouble for something! What a wonderful story! I'm still lucky enough to have my mom, which I truly started appreciating when my dad died last spring. Debs, so funny! You don;t know how I could have killed to be Debbbie. ALL the cool girls were Debbie. (Or Linda.) And I was Harriet. I rest my case. Julia: I agree. You are not Julie. FUnny how that's so clear. Stephanie (Bootchie!) --that is such a lovely explication of your dream. Perfect. AndI must say--Bootchie is very very cute. And Rhys, you've done it now. Cookie. LOVE that. I must tuck that away in my so-called memory. And as for you, Kathy Lou,… that is adorable. And yes, Mom did look like a movie star. And coincidentally, she was named after Miriam Hopkins. And her sisters were NOrma, after Norma Shearer, and Sylvia, after Sylvia Sidney. I was named after my great uncle Harry. Sigh. Yes, PAt D. people call Jonathan "Jon" to be familiar. NO one has EVER called him that, and, like you, he thinks it's very annoying. Oh. I forgot the nickname my husband calls me. Sweese. It came from a Mexican lady who couldn't say sweets; called her husband Sweese. Frank picked it up and now it is another name to answer to. That is pronounced sweets without the t. Does NOT rhyme with cheese! Ms. Barley, we will all call you Kaye Alan, if you'd like. You only have to ask. My new baby grand niece is Bella James Brenner. Her mama's family gives all the girls male middle names. LOVE that, Karen. Very cool. And what a perfect name! I still surprise myself with the things I do just as Mom did them, and I still feel her love and support and remember how proud she was of my work as a teacher. Ever so often, discovery of the home life behind a student's behavior would prompt me to thank her for the "boring" life she and Dad provided for us, and I think that made her proudest of all. I love your nickname, Hank, however it came to be. It manages to be tough and cute at the same time. I've mostly just been Mary, or Mary Frances to the relatives on Dad's side (so many Mary variations among the many cousins), and Miss Garrett to students, which sometimes confused those who had grown up in my neighborhood, used to being on a first name basis. Hugs! Mary Elizabeth grew on me after a while. It's just that the family around me every day ONLY used that when I was in trouble, so to hear my aunt and uncle casually drop it was...unnerving. The other name (not really a nickname, but something people used to use) was "Little Mary." As opposed to Big Mary (my mother). I hated it - HATED IT. Generally used when people called on the phone. Oddly, my daughter (also a Mary) would rather be called "Little Mary" than "Mary Patricia" or "Mary P" or "Mary Pat" (only one guy, an elderly gentleman from our church, could get away with that one). Of course now she has her own phone. Different strokes for different folks I guess. As a youngster I was called Deborah at school and Debbie pretty much everywhere else. I grew to hate Debbie and at some point started signing cards and letters to friends and family as Deb, and introduced myself as Deb. A teacher I had in high school used to pronounce the "O" in Deborah when she spoke to me and I could not get her to understand that the O is silent. She finally began calling me Debs. (By the way, she ended up being my all-time favorite teacher.) Most of my friends call me Deb. I tend to use Deborah at work, mainly to make sure people are not tempted to call me Debbie. Overall, I do prefer to be called Deb, and depending on my mood, may correct people who call me Debbie after I have told them that I'm Deb or Deborah. Most of my older relatives call me Debbie. My youngest nephew and niece, who are brother and sister, like to argue with each other as to what my name is. "Mom calls her Debbie!" "But Aunt Deb likes to be called Deb!" Their mother, who is the sister who is closest in age to me, was christened Betty-Jane. An aunt and uncle came to visit when she and my mom came home from the hospital. My aunt held the baby and exclaimed "she looks just like a Betsy!" And that is what she's been called ever since- except to that aunt and uncle and their kids. Their branch of the family calls her Betty-Jane! Miss Garrett! Love thinkibg of you that way..
And Yes,I can see how Little MAry might be annoying. xoxoo ANd yet, your daughter approves. People are funny. As we (happily) say here every day. I know it's rather late, but I hope you see this comment, Hank. One of the reasons I love your name so much is that it was my father's nickname in his family and used by people he knew when he was young. His full name was Henry Huddleston Boone, and I thought Hank was a very cool nickname.